•Irrigation of more than one million acres of land in the United States and nearly half a million acres in Mexico. These croplands, some of America’s richest, grow a wide variety of fruits, vegetables, cotton, wheat, and hay throughout the year, generating millions of dollars for local economies. The power plant is located at the toe of the dam, with wings that extend downstream 650 feet along each canyon wall. The turbines are designed to operate at heads ranging from 420 to 590 feet. 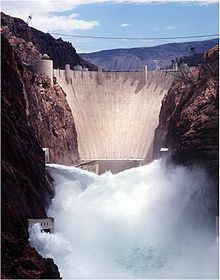 Water reaches a speed of 85 mph by the time it reaches the generators. •Surrounded by rugged mountains and canyon walls, Hoover Dam and Lake Mead are outstanding scenic and recreation attractions. More than one million people a year now take guided tours of Hoover Dam, and more than nine million people visit the Lake Mead National Recreation Area annually. •National Park Service concessionaires provide lodging, boats for hire, and sightseeing boat trips on the lake as well as through Black Canyon below the dam. Other popular activities are camping, picnicking, swimming, boating, water skiing, and year-round fishing for striped bass, large-mouth bass and other game fish. A large part of the area is open to hunting.